Kermit Place is a street in a small community located in a pocket, surrounded by Ocean Parkway to the north and west, Coney Island Avenue to the East and Caton Avenue to the south. This slightly isolated patch sits between several different sections of Brooklyn and — depending who you talk to — is either a part of Windsor Terrace, Kensington or Prospect Park South. Kermit Place runs parallel to Caton Avenue which is a narrow two way street that connects Linden Boulevard to Fort Hamilton Parkway. 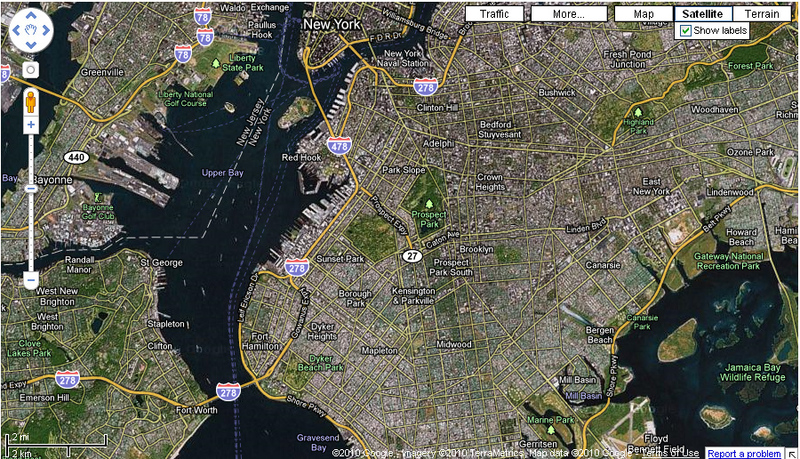 Linden, Caton and Fort Hamilton conjoin to form a major truck route that traverses Brooklyn and runs from Kennedy Airport to the Verrazano Bridge. Caton Avenue is like Main Street for the Kermit Place community. 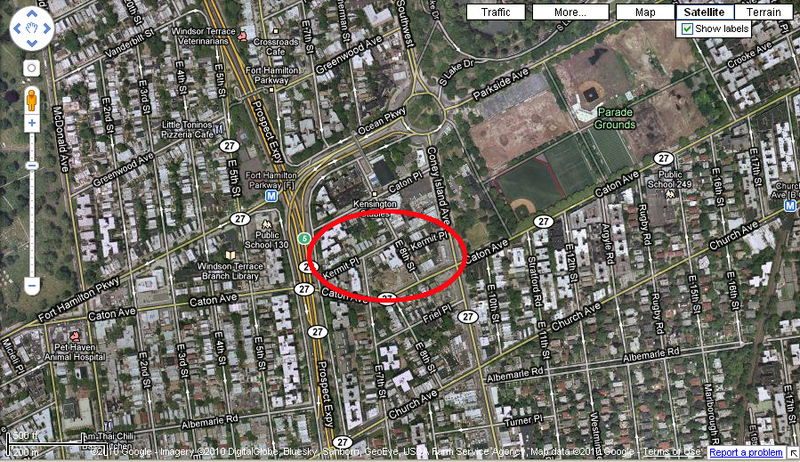 The entire length of Kermit Place falls within the red oval. Its is bisected by East 8th Street and bracketed by Coney Island Ave. on the East and the Prospect Expressway on the west. If you cross Coney Island Avenue at Kermit Place, you will enter the "Parade Ground," a 40-acre recreation area that offers baseball, tennis, soccer and football fields for local schools, leagues and clubs. There are also basketball and volleyball courts and a "boulodrome" for playing Petanque, the French version of Bocce (lawn bowling). In the southwestern corner of the Parade Ground is Bowling Green, an enclosed garden with a small wood frame house that serves as an office for park administration. Neighborhood volunteers maintain this small garden which is also used by the Kensington Stables for riding lessons. The Kensington Dog Run Association has announced that its proposal for a "Dog Run" in the Parade Ground of Prospect Park will become a a reality. The funds for this community improvement have been allocated through the Participatory Budgeting project of Council Member Mathieu Eugene of District 40 and capital allocations from Brooklyn Borough President Eric Adams. Construction of this new dog run have not been announced but we will try to keep you posted. 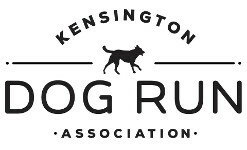 The Kensington Dog Run Association has a Facebook page at facebook.com/kensingtondogrun. While I regard the service at this post office as fairly standard, there are folks that really have a lot to say on Yelp; none of it good. 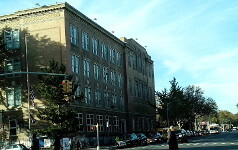 There is also an article in the Gothamist by Jen Chung entitled "Kensington Post Office - Worst Post Office in NYC." The article from March of 2007 feature a video of a man "going postal" at the branch with a service related issue. 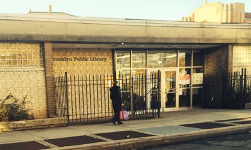 Windsor Terrace's first library service began in 1922 with a deposit station that housed a 3,000-book collection in a pharmacy. The most notable later move was to a library created from two abandoned street cars. The present 7,000-square-foot library opened in 1969 after a local campaign to upgrade the library service. With the addition of two new self-check units, the branch continues to serve the local community providing technology as well as traditional services. 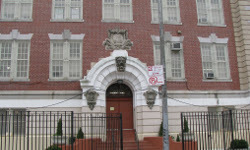 Housed in a building that dates from 1903, this pre K through 5th grade neighborhood elementary school has many special programs and an active PTA. A large neighborhood elementary school with a diverse population. 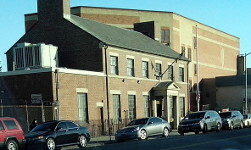 The school has a new annex down the block on McDonald near Church Ave that houses the lower grades. 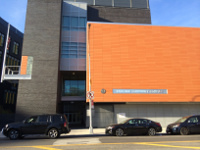 The Parkside Community Complex is a newly constructed public school housing MS 839 and classes from P.S. 130. It is currently in its first year of operation (2016 - 2017 school year). TBA Stay Tuned . . .